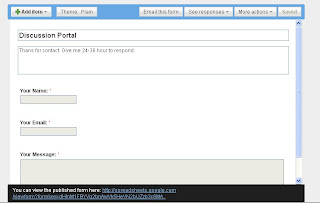 How To Add Contact Me Form In Your Blog. Contact me form is to contact you by your visitor for any purpose like link exchange, ask something personally etc. 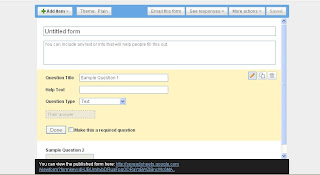 Do you want to add Contact Me form in your blog but don't know how? Here i am giving little tutorial to implement this. You can do this by google doc. Login your google doc with your Google ID or Gmail ID,Blogger ID etc. If you have not create one before. 3. It will be look like this in Fig-1. coloum write any message for your visitor. Mark this a required Question and then Press OK). to make it required field). 8. Your form look Like this. form here:----- at bottom of your form. with code copy this code and paste in your Blog. 11. Where to Embed ? code here. Publish this post. Change Month to older one. Still have problem ask in comment Box and i will solve it.